By virtue of the remarkable positive change he champions,Charles Lipenga is today an icon in Africa and the world at large. An award-winning Architect, Social entrepreneur and Youth activist,he was named a Global top talent by UNLEASH Lab and emerged as Commonwealth Young Person of the Year for Africa & Europe (2017)for his excellence in development work towards achieving the sustainable development goals. He is the Founder and CEO of Maestros Leadership Team; the United Nations awarded coalition of young social, technical and commercial leaders who solve persistent global challenges and has provided academic scholarships to more than 1,000 needy high school students across Malawi.His company has equally reached out to girls with sanitary towels, raising a team of 7000+ highly motivated young people in 22 countries across the globe, impacting lives of more than 50 000 people with leadership development programs. He is also the National Youth Ambassador of the Dutch initiative known as Building Bridges.,where he works with European youth ambassadors, Dutch Embassies and UN entities to foster youth employment in 8 African countries. The first project reached out to over 15 million people and was discussed in the UN Security Council. In 2017,he was one of the youths called to participate in the Obama Foundation Summit and he was one of the 4 African heroes celebrated during the 6th AU annual high level meeting. He has inspired million of youths around the world by creating opportunities that empower young people to create positive change.A multiple award winner for his works,he needs no further introduction.But Positive Youth’s Africa caught up with him to find out some things about him we probably don’t know. 1) You are an international resource person and you have been making waves internationally through your remarkable service to the Malawian community and Africa at large.Tell us two things about yourself we probably don’t know. I grew up stammering so bad I had low self-esteem and I lacked public speaking skills, or the confidence thereof. I remember every time I stood up to answer a question in primary school, It was so intimidating and frightening, knowing that my classmates are going to laugh at me so hard, and as a kid it meant a big deal. Though my dreams were to become a motivational speaker and mentor others, my dreams kept looking so faded for the longest time, and it was a battle I had to fight to become the person that I am today; I never gave up for I was strengthened in the abilities of God in me. I am a Christian who strongly believes in the power of the Holy Spirit and the purpose that God gave me to serve him and mankind. It is the very principles of the word of God that has led me and my team to where we are today; no education/ opportunity in the world is worth it if not for God’s will. 2) At which point in your life did you decide to serve your community and why? This is the time I realized that being called a Christian alone will not make me productive, I had to learn to devote myself in doing good for the urgent needs of others. It was amazing to find a great network of other young people committed to do the same. 3) What has been your greatest inspiration or what keeps you doing? Personally what keeps me going is the fact that I want to be productive and lead a fruitful life. Now look here, a fruitful tree does not eat its own fruit, others come to enjoy the fruits of it, and even take the seeds back home to sow. I love it when I see my influence creating opportunities for others to enjoy and even create opportunities for other people in their countries and communities. I aim at developing myself to become more of the person I needed when growing up and just like many of us in this world, I also believe that somebody, somewhere is depending on me to do what God called me to do. 4) You have bagged several awards and inspired thousands of youths.Which of your achievements would you call your greatest success story and why? 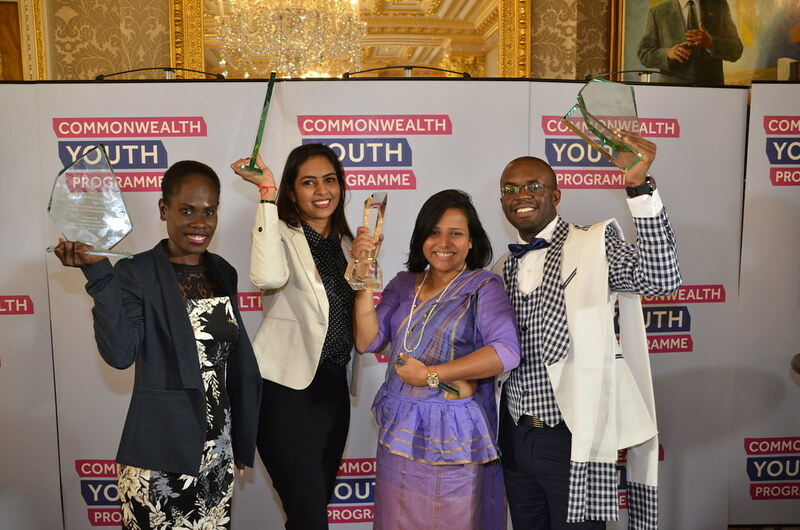 I believe the time I was awarded The Commonwealth Young Person of the Year for Africa & Europe in the United Kingdom (2017) by The Commonwealth for promoting the United Nation’s Sustainable Development in enhancing development towards quality and equal opportunities in education. Apart from the fact that I got to meet the British Royal Family which I admired and respected growing up. I would mark it as the greatest because itcovers the vision of Maestros Leadership Team for I was recognized for demonstrating exemplary leadership by impacting my generation positively through education, youth empowerment and mentoring, and through other projects aimed at building young people and preparing them for a positive future. 5) What has been your greatest challenge? Explain. Building a new career; the transition from my technical world was tough. I was professionally trained as an Architect in the Built Environments industry; that’s what I was good at, that’s all I knew, but my higher passion drove me to the social work. The truth is fear comes in when you are taking a risk, but like what they say, you will never know what you would become if you don’t try. Thank God I had a great support system; friends and family are key in the development of our careers. 6)You have traveled round the world and observed how youths behave. How would you compare youths in Malawi or Africa to youths in other continents? I believe culturally in Malawi, like some African countries we are raised with a community spirit and moral values being emphasized from our homes, schools, churches and societies. I think that is something our generation should also hold dear to, and not try to imitate other cultures. As much as the same community interdependence has crippled some but it our strength even as a young generation. I have observed that this Ubuntu spirit is really from Africa, and it is our responsibility to pass it on to the next generation. 7) What kind of Africa would you want your children to live in? I believe in the vision of Africa that is politically, socially and economically successful. A continent full of people that will be socially secure, where we don’t need to spend so much to prove a point for others to see. That is why Maestros Leadership Team aims at developing and equipping young people into leaders who have purpose, motivated by service to humanity and driven by sustainable results to achieve. I dream of an Africa that will add value to every product we grow and invent. Africans creating corporations and supporting each other with partnerships that will develop the continent; factories booming everywhere, creating jobs and growing the exporting industry to support our education systems. List of 100 Most Positively Inspiring African Youths Released!